Our expert commercial wood floor sanding in London is professional, reliable and affordable. A large number of businesses in London have wood floors at their premises. These floors are either there to serve an aesthetic or a practical purpose. 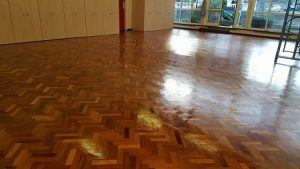 At FK Floor Sanding we understand that wood floors in offices, public buildings, gyms, dance studios etc. take a great deal more punishment than domestic floors do. As a result these hardworking floors need as much – if not more – attention and care than domestic wood floors do. Commercial wood floors become scratched, stained and chipped. This is because items such as furniture are dragged over them, objects are dropped onto them, liquids get spilled and people track in dirt and grit. All of this causes damage to wood surfaces. While the property owner, manager or tenant can do take actions to minimise damage such as regular sweeping and vacuuming and taking care when moving things, eventually these floors need expert attention. That’s where the experienced professionals from FK Floor Sanding come in. The best way to deal with surface problems such as scratches and stains is by sanding wood floors. Our team will prepare the room that is to be sanded by removing any items that have been placed on the floor if the client has not already done so. The floor is then swept and or vacuumed very thoroughly in order to remove all loose debris. We also check carefully for protruding nails, screws or other objects in the floor and remove them. Once the floor is thoroughly clean the sanding process can begin. We use highly specialised, dust-free sanding equipment. The first sanding is done with a coarse abrasive. The floor is a little rough after this initial sanding. As we continue to work the grit level used becomes increasingly fine. After each sanding the floor is cleaned again. This is to ensure that no debris remains on the surface that could cause scratching. This sanding process continues until we have a perfectly smooth floor. At this point it is up the client to decide what staining or finishing they wish to have. It is not obligatory to use our services for the staining or finishing processes. Our expert staff members are highly experienced, however, and it makes sense to use our team to move from the sanding to the finishing. Our craftsmen will also make recommendations as to any repairs or renovations they feel are required. While we do use equipment that ensures dust-free sanding, we can’t unfortunately avoid the noise that the sanding machines generate. However, we try to cause as little disruption as possible to our clients. We achieve this by being very flexible and operating outside regular business hours when necessary and possible. To find out more about our commercial wood floor sanding in London or to book a time for us to carry out an assessment and provide a obligation-free quote, please contact us on 020 3909 7641.